Charge. If the auroch moves at least 20 feet straight toward a target and then hits it with a gore attack on the same turn, the target takes an extra 14 (3d8) damage. If the target is a creature, it must succeed on a DC 15 Strength saving throw or be knocked prone. Gore. Melee Weapon Attack: +5 to hit, reach 5 ft., one target. Hit: 14 (2d8 + 5) piercing damage. 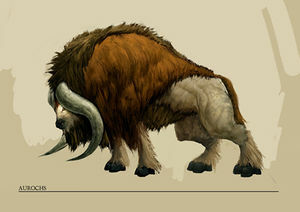 The aurochs are grand oxen creatures, originally from the Beastlands but managed to migrate to Faerun and now wander the plains. This large, horned bull has a dirty black hide and an aggressive temper. Its horns are wide and sharp.